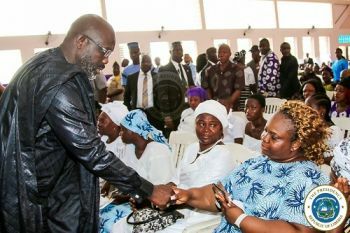 Monrovia, Liberia - President George Manneh Weah Friday, February 8, 2019 joined dozens of mourners who congregated at the Monrovia Christian Fellowship Church on 9th Street, Sinkor to pay their last respect to fallen former Deputy Minister of Defense for Operations Ernest Varfee. The demise of Varfee, a brilliant young Liberian, shocked the nation, particularly President Weah who had reposed confidence in him to serve as Deputy Defense Minister in the hope of bringing dynamism to the security sector reform program enshrined in the Pro-Poor Agenda for Prosperity and Development (PAPD). Paying his final respect and leave-taking to the late Ernest Varfee, the President and Commander-in-Chief of the Armed Forces for Liberia, said “rest on ‘Sedeke, Professor and my comrade’. I salute you”. Appointed on February 5, 2018, the former Deputy Minister of Defense was confirmed February 22, 2018. In a statement issued a day after his demise, President Weah said he was deeply saddened and devastated by the tragic occurrence, extending condolences to the Defense Ministry and his family. An array of government officials including cabinet ministers and former Vice President of Liberia, Joseph N. Boakai, joined the President at the fallen defense official’s funeral, which was characterized by deep emotions and moving tributes.